--the professor whose enthusiasm about the topic I was researching nearly matched my own. Our first stop was “Istanbul, not Constantinople.” For you younger readers, that is from a song first recorded by the Four Lads in 1953. It was supposedly spring there. 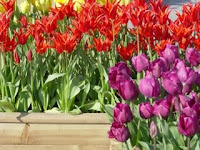 Flowers bloomed in the parks and tended roadways were lined with pansies, primroses, daffodils and masses of tulips, the flower they introduced to Holland. I say “supposedly spring” because it was cold. I wore six layers: camisole, long-sleeved shirt, short-sleeved shirt, sweater, sweatshirt and windbreaker. My hands were like icicles, as we had not packed for winter weather. Each morning began with a traditional Middle Eastern breakfast: hard-boiled egg, dried fruit, olives and cheese. The food was excellent but I wonder again, as I do almost everywhere we travel, why fruits and vegetables in other countries taste so much better than those at home. I found myself enjoying sweet carrots, juicy oranges and musky bananas, foods I eat sparingly at home. We visited the Kapali Çarşi (pronounced “charshi”), the world’s largest covered bazaar, multiple times. I had expected something like the Khan el-Khalili in Egypt but it more closely resembled the shopping district in Bologna, with wide streets and covered archways, decorated with mosaics and fountains. 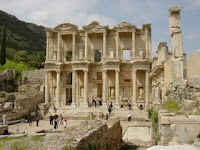 Ephesus was a lesson in humility. At its grandeur, this large city was as sophisticated as any modern American city. Ancient visitors must have gawked with craned necks just as I did when I first visited New York City. Public buildings were massive constructions. Public toilets were plentiful. Storefronts were ornate. Street gutters carried away waste and running water was used for “air conditioning.” Walking the same street stones as the ancients, down the sloping avenue dominated by an imposing library, transported us backward and forward at the same time and it struck me that, aside from the development of the motor and the computer chip, we have not really progressed as far as we might believe. 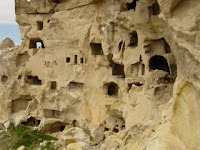 For centuries people in the Cappadocia region of Turkey carved their homes out of the mountains and hillsides. There are few natural resources to build houses, and caves are fairly easy to hew out of the malleable stone, so people lived this way until just a few decades ago. Early Christian hermits chipped caves into the cone-shaped hills until, in the fourth century, Athanasius and others organized the recluses into monasteries, also carved out of the mountains. Whole basilicas sit inside the rock. om into two, niches for the lighting. After extensive research in libraries and on the internet, we can be tricked into believing that we have a comprehensive grasp of a topic when, in fact, we have only understood the surface. I had already drafted my novel and wanted to go to Cyprus “for the flavor,” before beginning the endless editing process. It is fortunate that I did. I could never have imagined the height of the mountains or how they create a bowl around the island. I could not have imagined the colors of the water or the intensity of the sun. And I would never have met Dr. Mehmet Hacişevki. Dr. Hacişevki has trained many of the travel guides in Northern Cyprus and helped establish their tourism industry. He also teaches international relations, has studied in France and Germany, and holds a wealth of information in his head. Prior to our adventure touring historical Cyprus, he read David Hunt’s book on Caterina Cornaro so that he would know more about the woman who had captured my imagination. 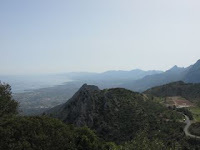 I worry that academics will not take me seriously when they learn I am writing a novel, but Dr. Hacişevki said, “Then you will need to learn the facts but also capture the romance.” He took us to the heights of St. Hilarion, guided us through the remains of the Lusignan palaces and walls, and even described the significance of the plants that grow in abundance around those walls. I feel blessed by his knowledge and generosity. My most enduring image of Turkey is one we did not capture well on film. It is a metaphor for a country that was the capital of the Christian Byzantine Empire and is now 99% Muslim. 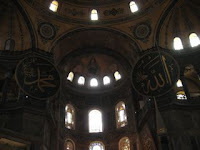 In Hagia Sofia, as in many Christian churches that became mosques, Muslims covered over the Christian images. Although Muslims respect Jesus, his mother and the saints, they are prohibited from representing human figures. When Ataturk, the Father of modern Turkey ruled, he converted Hagia Sofia into a museum and uncovered some of the artwork. Now, over the apse, there is a mosaic of Mary holding Jesus. To the right is a large medallion with the Arabic for “Allah” and to the left a medallion that reads “Mohammed.” Professor Hacişevki, my historical mentor in Turkish Cyprus, said that I was “precisely correct” in choosing this image as symbolic of Turkey. Traveling is magical. We see history come to life. We satisfy a longing that our reading and study has stirred in us. It opens our minds and hearts to the world. Most important, we learn that people are simply that: people. Children smile easily, push their friends, sing spontaneously. Mothers kiss their babies’ heads, swat their children’s bottoms, and hold them close. Merchants hustle (in both senses of the word), cajole, and exaggerate. Religious leaders walk with hauteur but reverence. We all smile, we all laugh, we all cry. We are all the same.